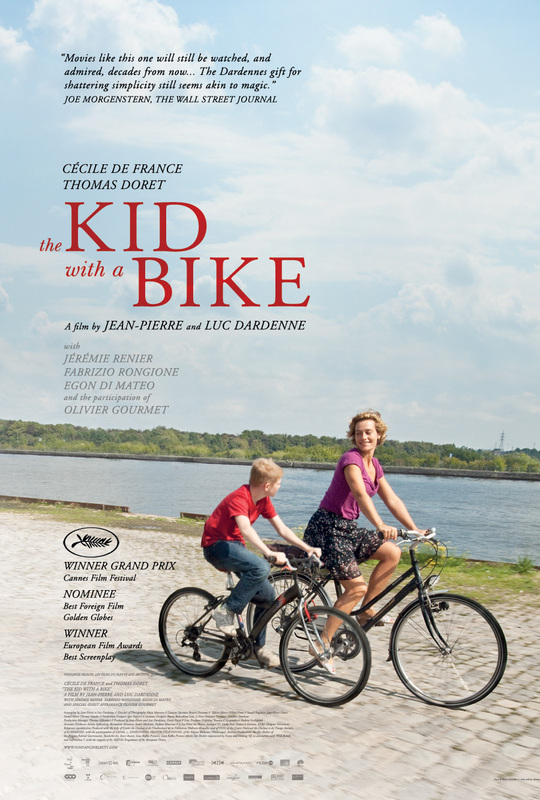 On paper, The Kid with a Bike doesn't sound like something that the directing duo of Jean-Pierre and Luc Dardenne would typically tackle. The plot synopsis sounds deceptively cloying - a young boy, abandoned by his father in an orphanage, gets a new lease on life through the love of a stranger who takes him under her wing. This doesn't sound like the typical fare of the directors behind L'enfant (in which a man sells his newborn son for money) and Lorna's Silence (where a woman marries a man to gain citizenship, with dangerous consequences). But if the Dardennes have taught us anything, it is to constantly expect the unexpected. Their films often play out like complex morality plays, with deeply wounded characters who make bad decisions, and must face the inevitable consequences. In that regard, The Kid with a Bike fits comfortably into their oeuvre, despite its (sparing) use of music, which is something of a departure for the Brothers Dardenne. But even at just a few notes long, the one piece of music that repeats itself occasionally throughout the film adds just the right amount of devastating punctuation without pushing or manipulating the audience with any unnecessary sentimentality. Samantha (Cécile de France) and Cyril (Thomas Doret) in Jean-Pierre and Luc Dardenne’s THE KID WITH A BIKE. Photo by Christine Plenus. A Sundance Selects release. That has always been something of a Dardenne trademark, but here the feat seems almost more remarkable. After all, films dealing with orphaned children, especially when the film completely centers around one, can very easily fall into the trap of blatant audience manipulation. Children are in many ways the ultimate cinematic manipulation tool, but true to form, the Dardennes deftly avoid any such pitfall with seemingly effortless grace. The entire film rests on the shoulders of young Thomas Doret as Cyril Catoul, a young boy who has been abandoned by his deadbeat father (Dardenne regular Jérémie Renier) in a children's home. Cyril believes that it is only for a short time, but after not hearing from his father for a while, he tries to contact him in order to retrieve his beloved bicycle. Unable to reach him, Cyril constantly runs away from his keepers at the home, trying to find his dad by any means necessary. Instead, he discovers the hard truth that his father has moved without leaving a forwarding address, and that he sold his beloved bike. In a random act of kindness, a woman who witnessed Cyril's meltdown (Cécile De France) tracks down his bike and buys it back for him. Cyril immediately feels a connection with her and asks if he can stay with her on weekends. She agrees, and the two form a tremulous bond, and a shared determination to reunite him with his father. But when circumstances suddenly change, Cyril begins acting out, and as the wrong crowd beckons to pull the troubled boy in a dangerous direction, Samantha's love for him may be the only thing that can save him from the edge. Guy Catoul (Jérémie Renier) and Cyril (Thomas Doret) in Jean-Pierre and Luc Dardenne’s THE KID WITH A BIKE. Photo by Christine Plenus. A Sundance Selects release. In the hands of lesser directors, The Kid with the Bike could easily have become one big saccharine coated schmaltz-fest. But under the careful control of the Dardennes, the film becomes something wholly remarkable. It's an impressively restrained portrait of a troubled young boy trying to navigate his way through an increasingly complicated world. Cyril's relationship with Samantha feels completely natural, never forced or overly coincidental. The Dardennes are adept at allowing their characters to just be, and the story develops without unnecessary frills or fanfare. None of it would have been possible, of course, without a strong central performance, and Doret is uncommonly good as Cyril. Child performances are always a gamble, especially when they have to carry an entire film on their shoulders, but Doret proves himself more than capable, appearing in nearly every frame of the film, more than holding his own beside veterans Renier and de France. Without him, one imagines the film would not be the success that it is. The Dardennes' tender and deeply human vision is perfectly summed up in the film's final shot, which may seem a bit abrupt but upon reflection one comes to see that it really couldn't have ended any other way. It is a symbolic summation of the entire film, crafted in the Dardennes' typically unassuming way. In fact, "unassuming" is probably the best word to describe The Kid with a Bike. It's a devastating film told with great emotional economy and quiet dignity. The Dardennes say so much using so little, and just as its brief musical theme only appears during fleeting moments of thematic import, the auteurist brothers consistently play their cards close to the chest, resulting in a huge emotional payoff that resonates more deeply than its sparse elements might suggest. It is perhaps their most accessible film, but that shouldn't deter their more ardent, art house fans - The Kid with a Bike is something very special indeed. 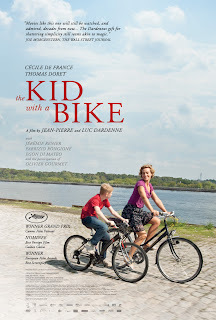 THE KID WITH A BIKE | Directed by Jean Pierre & Luc Dardenne | Stars Cécile De France, Thomas Doret, Jérémie Renier, Fabrizio Rongione | Not rated | Now playing in New York and Los Angeles.